Drones make it easier for governments to opt for military intervention rather than negotiation, because drone pilots' lives are not at risk. RAF Reaper drones are guided from comfortable seats in Waddington, near Lincoln. Physical distance makes victims seem less real: more like targets to "splat" in a computer game than human flesh and blood. Drones have encouraged "targeted killing". It is cheaper and more convenient to "eliminate" wrongdoers than to bring them to trial or to keep them in Guantanamo. The arms trade will encourage the spread of drones to other nations, and eventually to terrorists. Drone strikes cause resentment, leading to radicalisation and the creation of more enmity. Details of drone targetting can be withheld from the press, reducing the constraint of public concern. Read the latest research on British drones. 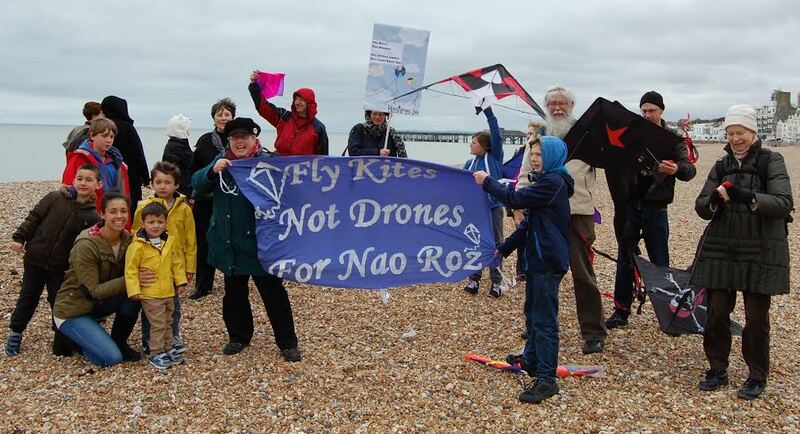 The Fly Kites Not Drones campaign takes place annually around the time of the Afghan New Year (Nao Roz) on 21 March, in solidarity with Afghans living under constant threat of armed drones. The campaign was launched in the UK by Voices for Creative Nonviolence, moved by reports from Afghanistan of children frightened to play outside and fly kites under the clear blue sky, for fear of a drone strike. For Afghans kite flying stands for freedom. It was forbidden under the Taliban. Nao Roz 2016. Hastings Against War on the beach opposite the Carlisle pub.